by anasilini ratuva, in rio de janeiro, brazil. Team Fiji women’s rugby sevens forward Litia Naiqato (with ball) looks for support as captain Ana Maria Roqica closes in against USA yesterday. USA won 12-7. Photo: Zimbio. 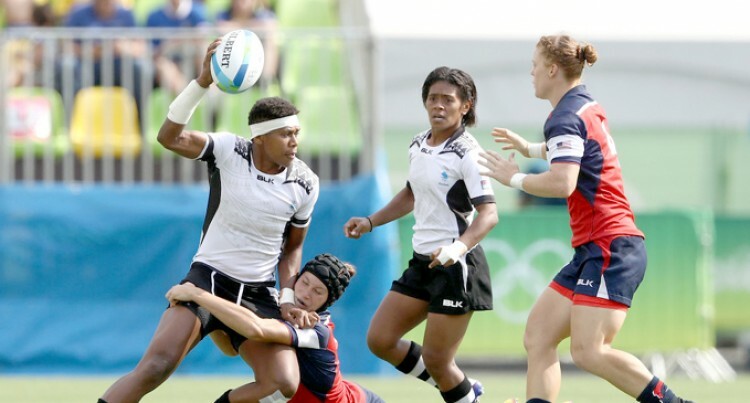 The Team Fiji women’s rugby sevens team have finished eighth at the Olympics after losing 21-0 to Spain in their playoffs at the Deodoro Stadium in Rio de Janeiro, Brazil yesterday. Having missed out on a semi-final berth, the Chris Cracknell coached-side were earlier beaten 12-7 by the United States- a reversal of the score-line when the teams met in pool play- before being outclassed by the Spaniards. Prime Minister Voreqe Bainimarama tweeted to congratulate the women for their performance. “We are all proud of your efforts on the field,” he tweeted. Fiji’s eight placing matches their final ranking in the past two World Series campaigns. Australia won the first women’s rugby sevens Olympic gold medal, beating New Zealand 24-17 in the final, while Canada beat Great Britain 33-10 in the bronze medal playoff.